Mankind today is standing at a crossroad of development. As civilization grew the virgin earth had abundant natural resources and with the technological revolution there was rapid industrialization and economic development. It was the time of development without restriction and only economic development was assumed to be the parameters of human prosperity, peace and happiness. Unfortunately, some of the very human development activities which brought economic prosperity to mankind have caused colossal destruction to the global human ecosystem. In reality, the natural resources of the ecosphere are being wastefully consumed at a constantly increasing rate under the combined effect of population pressure on the one hand and the increase in agricultural and industrial production on the other. The book aims to provide a general frame work to ensure sustainable development and to improve quality of life of people through proper environmental management. The volume suggests strategies for efficiency and accountability in the rational use of resources in the desert ecosystem. 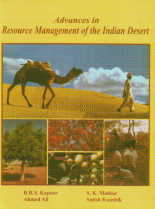 The book lays emphasis on a research perspective to integrated resource management of the Indian desert through three broad sections covering twenty four chapters. Each chapter of this reference text is well-written by the leading experts and scholars having long standing in research in their respective fields."